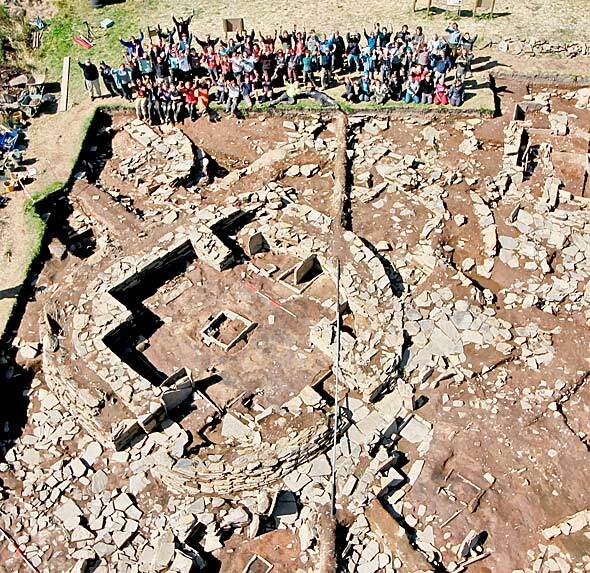 Farewell till next year from all the Ness of Brodgar team. That’s it, folks. With great sadness we have to say that this is the last dig diary of the 2014 season at the Ness. Scanning across the site, the signs of the end are to be seen everywhere. There are only a score, or so, diggers left and they are operating inside what looks like a giant garage with pile upon pile of tyres all ready to be rolled out onto the site to hold down the protective plastic sheeting. The monumental task of covering the precious structures will start on Thursday and, with another season of excavation completed, it will be an even more arduous task than before. Again, we would like to welcome any local volunteers who can manage along on Thursday and Friday to help. We promise you the best close-up view of the site you will ever have, short of actually excavating. An aurochs in the mound? As ever with the Ness there has been excitement right to the very end. Antonia discusses Jenny’s latest discovery of art on the wall of Structure Eleven. We have mentioned the surprising find of a very large animal at the top of the mound in Trench T.
A huge horn core is visible, together with part of the skull of a truly massive animal. It is so big that there was an immediate need for an expert opinion and that has now been provided by Jen Harland. She has confirmed that the bones belong to an enormous cow – so big indeed that it is probably off the scale for the biggest known modern cow and into the range for an aurochs. This is remarkable news. aurochs are a primitive, and very large, form of cow, probably pretty rare by the Neolithic although there were still a few around. We seem to have one. Further identification will be needed and this will have to wait until next year when the contexts can be properly excavated without the need to rush. However, it will have important implications for our understanding of the agricultural economy of the Neolithic in Orkney, and for the range of animals present at that time. Meanwhile, back in the main trench, finds are still being made particularly art. 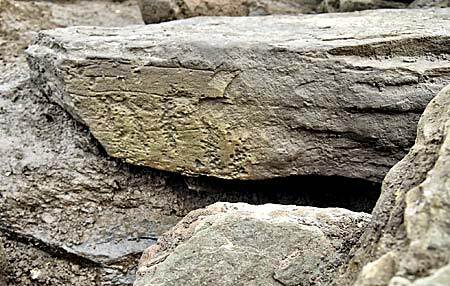 Jenny, while dismantling a later buttress on the outside of Structure Eleven, revealed some finely incised designs, while Joanne discovered a pecked motif while working in the fill of the paved pathway around Structure Ten – as if Antonia didn’t have enough to catalogue and photograph! Joanne’s pecked motif from just outside Structure Ten. If we are sad at the end of the dig, there is still one happy task to undertake. That is to thank the many, many people who have worked, helped and contributed to the complex and difficult task of making this archaeological excavation such an enormous success. We would like to start by giving warmest thanks to our hosts, Arnie and Ola Tait, whose field encompasses much of the Ness and whose outstanding generosity has allowed us to dig it up year after year. We also want to remember Carole Hoey, who was so helpful when she lived at Lochview and who has kept in touch and very much up to date with all that is happening. Thanks also to Professor Jane Downes, who heads the Archaeology Institute of the University of the Highlands and Islands, to county archaeologist Julie Gibson and to Professor Mark Edmonds, who leads a large academic investigation of lithics on Orkney and who is also to be found, happily covered in mud and digging in Structure Ten day by day. Huge thanks also to Dr Ingrid Mainland for her work on SmartFauna and other aspects of animal bone on site. The hero and heroine of the dig are Rosemary and Neil McCance, who prepare the small finds bags for the excavation. This year they have processed nearly 4,000 bags. It is a truly Herculean effort and, as we asked last year, if it was not for Rosemary and Neil, where would our finds go? Many thanks to Sigurd Towrie, who hosts out diary and sundry other outpourings on his Orkneyjar website. Sigurd combines expert journalism with a breadth of archaeological knowledge. Without him it would be much harder for news of the Ness to reach the outside world. We would like to thank Orkney Islands Council, the council archaeological fund and culture fund for their support. 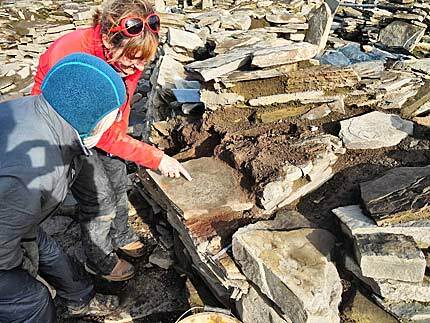 The council and its officials have been quick to realise the huge amount of money which Orkney archaeology, and the Ness in particular, pours into the county coffers year by year, and this recognition and support is very welcome as we grapple with the significant funding problems which running such a large archaeological excavation inevitably bring. We are very grateful to Orkney Heritage Society for allowing us to use the house of Lochview for such things as labs and office space. Particular thanks are due to Orkney Archaeology Society, and especially to Annabelle, who has managed the exhibition trailer with such apparent ease, although we all know what a difficult job it is. Thanks also to husband, Jim, for all his help, and other members of OAS, like Linda and Jeanne Rose who have contributed much time to on-site tasks. We also want to thank Orkney College, UHI, and, in particular, Kat, who runs site director Nick’s office with huge professionalism and utter calmness when things go wrong – as they do, occasionally. Andrew and his team from Historic Scotland, Kenny Garrioch’s Garage and the Cement Works Garage are also thanked for their contributions. Many thanks also to Currie Brothers, Orkney, Helen Woodsford-Dean, Rik Hammond and Radio Orkney for their hard work and contributions to the effort. We particularly want to thank Talisman Sinopec for their very welcome support towards the site tours and web diary, and also to Scaffold Orkney. Special thanks are due to our annual visitor Professor Scott Pike of Willamette University, Oregon, and his hard-working students. We look forward to seeing Scott and a new batch of students next year. Also many thanks to Helen and David Smith for their support, encouragement and hard work on so many aspects of the organisation and funding. And a huge thanks to Antonia Thomas for all her invaluable work in recording the artwork at the Ness. Her keen eye and knowledge of Neolithic art is a vital component of our work. Good luck to her in integrating this years discoveries into her monumental catalogue for her PhD. Mention of funding means the warmest thanks to Caz and Dave Lawrence of Orkney Archaeology Tours and Pat Stone of Orkney Aspects. It was Caz and Pat who organised the campaign to raise contributions for this year’s viewing platform, and what a magnificent job they did. We also want to thank all those, from Orkney and around the world, who contributed so generously to the fund. We raised the necessary £2,000 in just two days, with some money left over for next year’s platform. Thanks to all. Moving on site, Nick wants to thanks his field supervisors, Dan, Hugo, Jim, Sarah, Mike, Claire, Ben, Mai, Seb, Andy, Anne, Jane and Catriona for their sterling work in often difficult conditions, and a special thanks to finds assistant Scott (you will be sorely missed next year!). Thanks also to Mac for his surveying and Ian for site filming. Huge thanks also to Cecily Webster, the off-site environmentalist, who was deluged with countless sample buckets for processing. We fear she may be at it for some time yet. Nick would like to thank not only all the other students and volunteers who have come from every corner of the globe to contribute their skills to the Ness but also every member of the public who have visited the excavation (both online and in reality) and help support this ground-breaking research – a monumental thank you to one and all! Also thanks to Martha Johnston, resident geologist, Roy Towers, resident ceramicist, Christopher Gee for weekend tours and to Anne Mitchell and her colleagues Scott, Jeanne and Linda in the finds hut for their remarkable efficiency and hard work without which the site would degenerate into chaos in minutes. We are grateful for the contributions made by external experts Jo MacKenzie and Lisa Shillito who bring their considerable expertise in areas which we are unable to cover ourselves. Almost last but not least to the Historic Scotland Rangers Sandra, Elaine and Keith for managing to fit the afternoon tours into their very busy summer schedule. Lastly, we want to remind you that the August edition of National Geographic magazine has a magnificent article and pictures from the Ness and that we will also feature soon on Digging for Britain on BBC television. We hope to bring you more excitement and interest from the Ness next year. Until then, goodbye (however we hope that you will continue to follow developments through the American Friends Facebook page and Orkneyjar, where there will be other follow ups in the near future).